My colleague and I just discussed how we admire the classic donut giant, Dunkin' Donuts, for surviving the industry competition amidst the introduction of new donut brands through the years. I remember my childhood days when my school bus would pass by its main branch along Aurora Boulevard. The aroma of Dunkin' Donuts was simply hypnotic then and still is now. Tambay sa nose kind of aroma and my mornings for 8 years in elementary were all made of that. Recently, I bought 9 donut pack as a pasalubong at a nearby Dunkin' Donut stall in our place, Pureza to be exact, (which by the way has been standing there for 21 years) and I saw this adorable "Eco-Mug." I immediately asked the staff how much I could get it for and surprisingly, it's only P60.00 with the bulk purchase I had. At retail, it's P180.00. With this kind of deal, of course I didn't think twice, I grabbed one. You would skip a heartbeat at how this "Eco Mug" looks. Here's the actual ECO-Mug I purchased in color brown. There are four available colors to choose from. Pick yours from Brown, Pink, Orange and Blue. 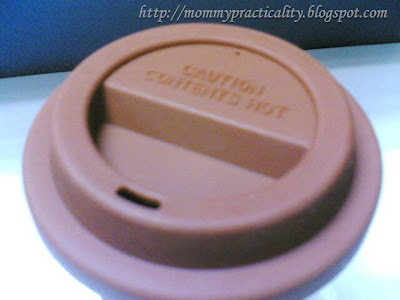 The Eco-Mug's lid is made of rubber. It is washable and seals the hot coffee perfectly. 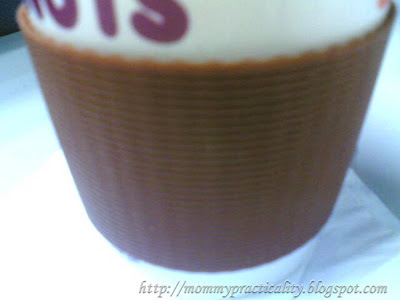 I was afraid at first thinking when I sip through the hole, it would be a spill mess. I'm glad it didn't, the lid perfectly fits the mug! The weaved design of Dunkin' Donuts' mug holder makes it all the more endearing. Since the mug is made of glass the hot beverage could burn your hand if handled directly. Thanks to this mug holder, I didn't have to experience the burning part. I have tried two or more other brand of donuts but like a child who's been injured and goes to her mom for comfort, I still keep coming back to Dunkin' Donuts. 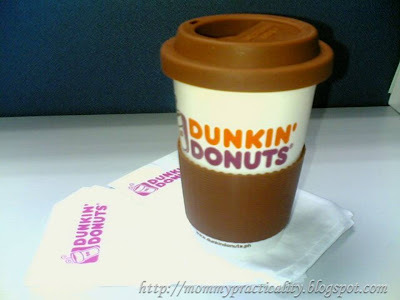 With their timely new campaign that cares for the environment by communicating 'Go-get-your-reusable-Eco-Mug-instead-of-styro-cups' I know Dunkin' Donuts will never fail nto make me love them more and more! Hi VERA! :) Thanks for visiting! Well, donut brands come and go, some remain hanging there, but I keep on coming back to Dunkin'! Plus yeah, they have this nice ECO-Mug! :) Have a nice day!